As some of you might have noticed our UCG halls have lacked the presence of our class of 2019. Now that your pretty faces have all returned back to Groningen, it's time to welcome you all back properly. We hope you had the time of your life abroad and are pumped to hear about your adventures from all over the world. This is why we hereby invite you to your welcome back dinner on the 12th of February at 18:30! All the third year students and the UCG staff are welcome! Don't hesitate to sign up ASAP to not miss out on this casual get together in the UCG canteen and enjoy delicious food made by the Sleeping Lasagnas, just like the "old" times. So see you soon! 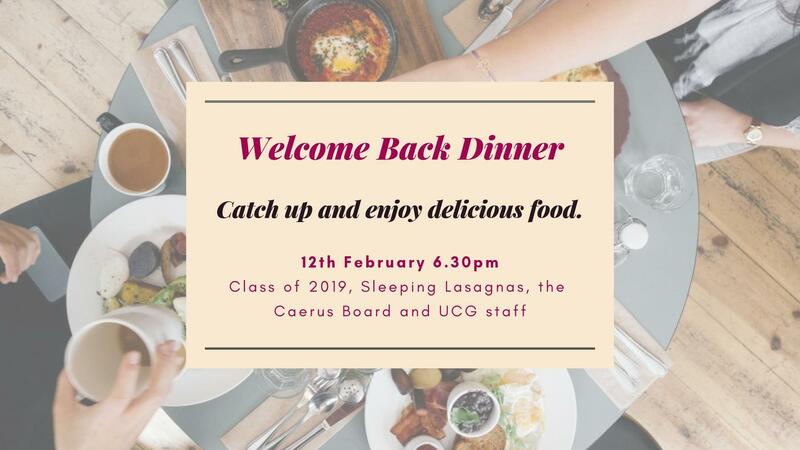 Please note this event is only open for Class of 2019, Sleeping Lasagnas, the Caerus Board and UCG staff.